No other area of drug development has received as much attention as the field of anti-cancer drug discovery and development. Despite major advancements in the understanding of the molecular basis of cancers, and the advent of several new classes of chemotherapeutics, prognosis in certain forms of cancers has not been improved substantially. This has led to a re-thinking of current drug discovery paradigm, and several out of the box ideas have emerged. The literature in this field is now enriched with several new approaches and extraordinary targets, which deserve to be highlighted for the benefit of the scientific community. 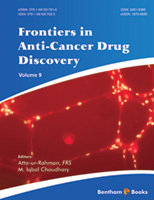 The 9th volume of the book series entitled, “Frontiers in Anti-Cancer Drug Discovery” comprises seven comprehensive review articles in this field. They cover therapeutic advancements against various cancers, study of the mechanisms of action of various anti-cancer drugs, and drug candidates, including natural products, and recent advancements in the new and novel target identification related to various types of cancers. These articles represent the state-of-the-art in the field of anti-cancer drug discovery and development and provide an in-depth understanding of the subject. The first article in the book series, contributed by Li et al., is a general review of the key issues and developments in cancer treatment, and emergence of targeted therapies. Compounds which induce DNA damaging response (DDR) in tumour cells have been developed as effective drugs for cancer treatment. The article provides examples and advantages of several drugs which target DDR through a variety of mechanisms. Li et al. have also critically reviewed notable findings in cancer immunotherapies. These include development of cytokines, oncolytic viruses, cancer vaccination, and adaptive cell transfer. The most exciting of them is the anti-CD19 CAR cell immunotherapy. These recent developments have brought new hopes in cancer chemotherapy. Cutaneous melanoma is the most aggressive form of skin cancer with poor prognosis. Over half the cases of cutaneous melanoma are reported to have activating mutation in BRAF kinase leading to the activation of kinase pathway and resulting in unregulated cell growth. BRAF kinase inhibition was therefore identified as a treatment option for cutaneous melanoma. Clinical outcome, however, has been only marginal. McKean and Amaria have critically reviewed the successes and limitations of various BRAF kinase inhibitors such as Dabrafenib and Vemurafenib, approved in recent years for the treatment of malignant cutaneous melanoma. Resistance against BRAF kinase inhibitors has been the key issue. The authors have also described the use of various combinational therapies including targeted therapy, immunotherapy, and dual inhibitors of BRAF and MEK. They concluded that BRAF inhibition is an attractive target for the development of anti-cancer drugs for other forms of cancers. Macroautophagy is a process that sequesters senescent or damaged organelles and proteins in autophagosomes for recycling of their useful components. This process is also involved in the removal of cells death due to classical type 1 apoptosis. Therefore, macroautophagy was primarily considered as a protection mechanism for cells against various stressors and wear and tear. Autophagy may also lead to a form of non-apoptotic type 2 programmed cell death. Cell protective (anti-apoptotic) or cell damaging role of autophagy seems to depend on many factors, including microenvironment of the cells. Autophagy and its role in diverse cells and conditions has been the focus of research for quite some time, with contradictory results. Recent studies have identified autophagy as the mechanism of survival of cancerous cells, under adverse environmental conditions. A review by Vaccaro and Gonzalez covers this interesting topic, with special emphasis on the role of autophagy in cancerous cell cycle, as a new target for anti-cancer drug development. Several classes of drugs which modulate autophagy and their mechanisms of action, have been discussed in this interesting article. Drug resistance is a cross cutting issue in various classes of drugs, including anti-bacterial, anti-fungal, and anti-viral drugs. In the case of anti-cancer drugs, drug resistance limits the choice of treatment, thus creating havoc both in health care professionals and patients. Ironically, drug resistance in target cells also generates a collateral sensitivity (CS) towards other drugs, compared to the parent drug against which resistance has been developed. CS networks are therefore now targeted for drug discovery against infections and cancer. This novel approach has opened a window of opportunity for new drug development. Pesic et al. have contributed a review of recent attempts to exploit collateral sensitivity in MDR phenotype cancer cells as the target for the development of new anti-cancer agents. The recent literature on the mechanism of action of MDR selective drugs and their potential use in combination therapy for cancer treatment has been professionally reviewed. Telomerase enzymes are among the most studied targets for a variety of purposes, including anti-ageing drugs. Telomers serve as protective caps at the end of DNA strands, and they are responsible for maintaining the length and integrity of chromosomes, thus playing a key role in cell survival. The enzyme telomerase is responsible for maintaining the length of telomers. This has been correlated in the uncontrolled growth of cancer cells, and its activity has been detected in over 80% of cancers. Porika et al. have focused their contribution on the potential of telomerase as a novel target for anti-cancer drug development. Telomerase inhibition is presented as an important approach to specifically target cancer cells. They have presented various classes of natural products which inhibit telomerase activity, and can thus serve as specific anti-cancer leads. The mechanism of inhibition of cancerous cell proliferation, and the results of clinical studies in some telomerase inhibitors are presented at great length. Gangopadhhyay and Gangopadhyay have reviewed the prospects of targeting cyclin-dependent kinases (CDKs) as drug discovery targets against various cancers. CDKs regulate cell cycle progression. CDK inhibitors can be used for the treatment of cancers as they can prevent the proliferation of cancer cells. In certain cancers, CDKs are overexpressed and thus lead to unregulated growth and proliferation. Inhibition of CDKs has been vigorously pursued in recent years for anti-cancer drug discovery, and US-FDA has approved several drugs of this class. The results of clinical studies and experiences on CDK inhibitors as anti-cancer drugs, as well as associated complications including resistance, are presented in this detailed review. Key issues with the CDK inhibitors include resistance and low selectivity. The authors have critically reviewed the advantages and merits of the use of dual CDK inhibitors and combination therapies, along with present and future prospects of selective CDK inhibitors for the treatment of various cancer types. Last but not least, the review by Yadav et al. describes several recent developments in the field of cancer treatment. Initially, several new classes of anti-cancer drugs capable of effectively targeting cancer cells have been described. Interestingly, these drugs include both well-established anti-cancer drugs and non-cancer agents such as statins, NSAIDs, and anti-diabetics. The authors have also presented results of recent studies on combination anti-cancer therapies versus single drug treatment. The above articles by prominent researchers in selected fields have made this volume another important treatise for scientists and research scholars. We are grateful to all the authors for their excellent and scholarly contributions for the 9th volume of this internationally recognized eBook series. The editorial team of Bentham Science Publishers deserves appreciation for efficient processing and timely management of this publication. The coordination and liaison by Ms. Fariya Zulfiqar (Manager Publications), under the leadership of Mr. Shehzad Naqvi (Editorial Manger Publication) & Mr. Mahmood Alam (Director Publications), are duly acknowledged. We also hope that like the previous volumes of this internationally reputed book series, the current compilation will also receive wide readership and appreciation.